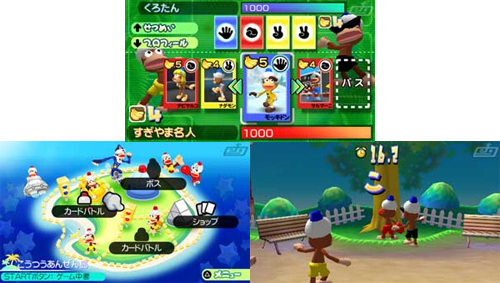 Masses of monkey themed mini games as players collect the many cards on offer with a few bananas changing hands, but not before a quick game of 'paper, scissors, stone' to determine which mini game is played. Progress round the map and eventually a boss challenge will become available. Beat the boss and not only will a new area of the map become accessible, you'll also get their very own card. Its also possible to unlock a bit of monkey magic in the form of costumes - the Santa and Terminator monkeys are real corkers. 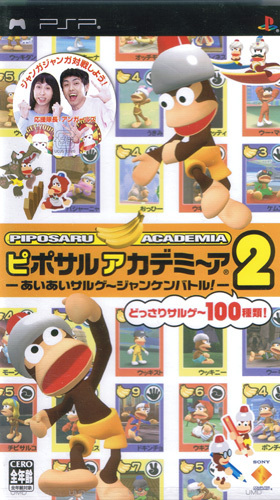 The sequel has vastly improved over the initial primate prequel Also known as Ape Escape Academy. 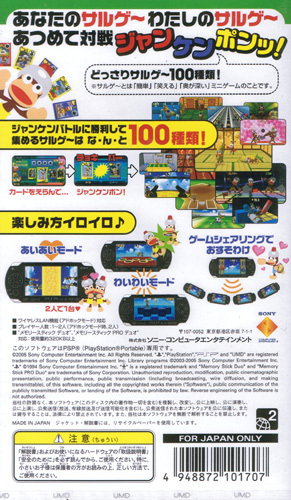 Subtitled 'Aiai Saruge Janken Battle'.